Did you know Earth Day was founded all the way back in 1970? While we’re no strangers to going green, there’s no doubt that there has been an increasingly conscious effort all over the globe to save the environment. Metal straws, reusable bags, carpool services… You name it, they have it. Now, the food industry has taken that mission one level higher. Companies and restaurants are now serving plant-based dishes to reduce our carbon footprint. The latest to hop onto the bandwagon is PARKROYAL on Pickering‘s Lime Restaurant. Located within PARKROYAL on Pickering, Lime Restaurant offers a wide range of local, Southeast Asian and international culinary delights. There’s also a plentiful buffet line and three open kitchens. The hotel is easily recognised by its stunning modern architectural elements. Its hotel-in-a-garden concept and energy-saving features throughout the building has also earned it multiple awards for sustainability. 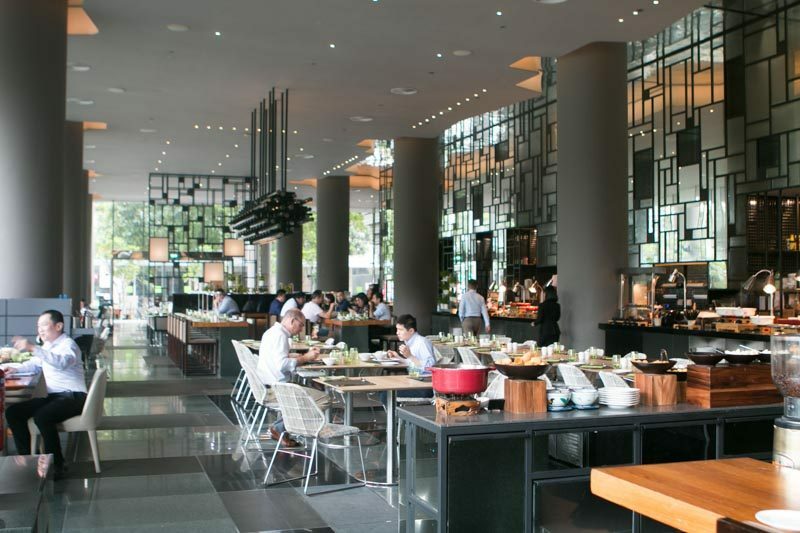 Floor-to-ceiling glass windows line the entire restaurant and the open dining concept has private dining rooms and few partitions. The chic, sleek and utterly gorgeous dining space was both comfortable and spacious. 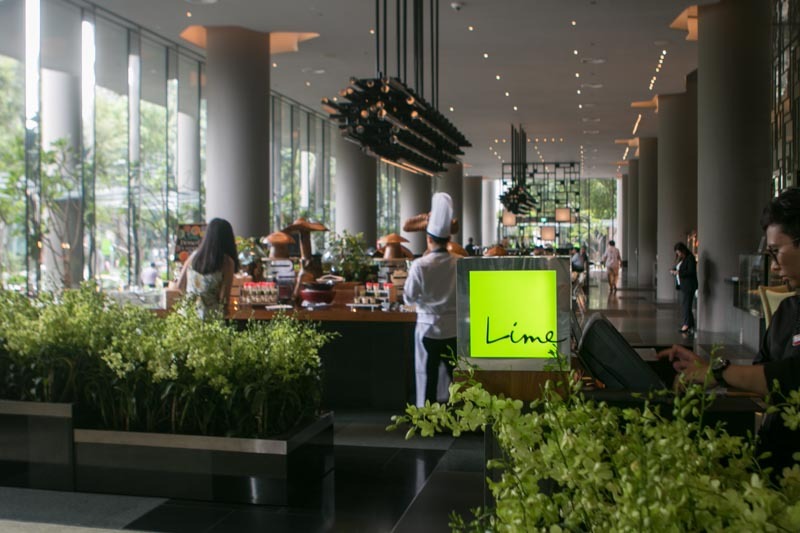 Given the hotel’s green streak, it’s little wonder that Lime Restaurant is the next to undertake a plant-based menu, which will be available for dine-in from 22 April 2019 onwards. 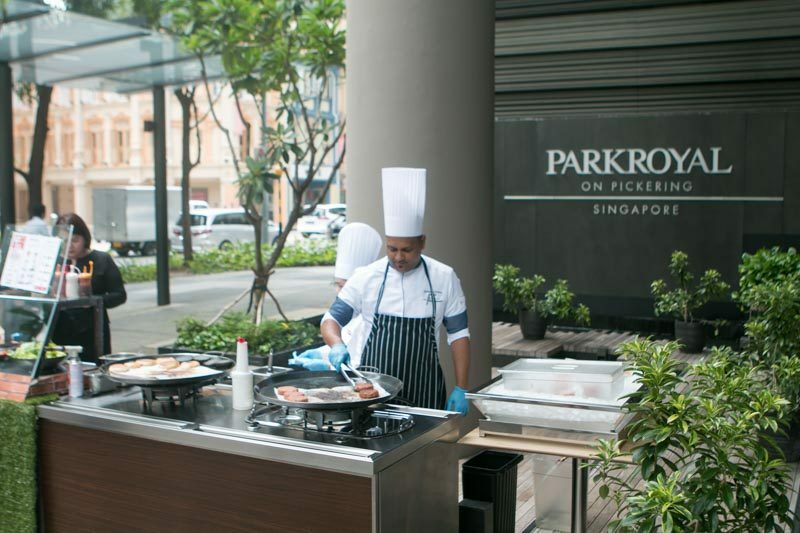 As a teaser, PARKROYAL on Pickering launched a ‘Green on the Go’ pop-up stall outside Lime Restaurant selling their Beyond Burger ® (S$13.80 nett) before it’s officially sold in the restaurant. We got a peek at its new plant-based menu and boy, it definitely doesn’t disappoint! 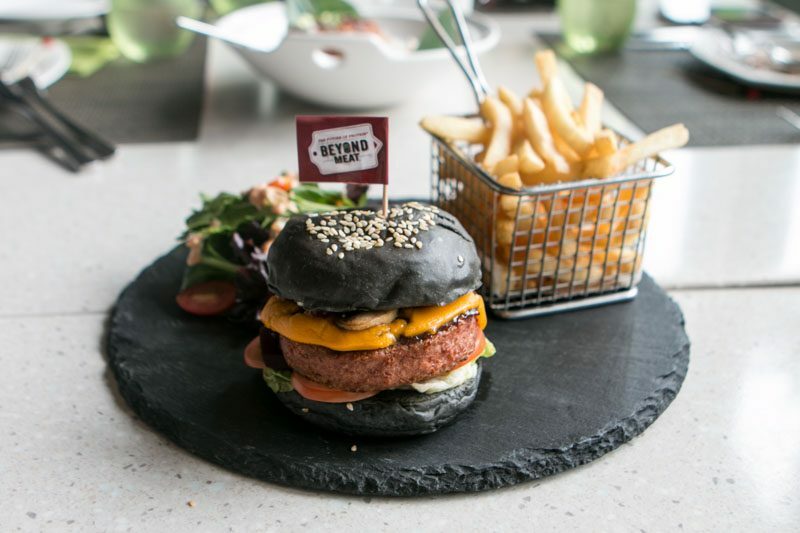 Sandwiched between two charcoal buns with toasted sesame seeds, The Beyond Burger ® (S$27++) consists of a Beyond patty, which is actually made of pea protein isolate, water, canola oil and refined coconut oil. Accompanying the burger are fresh vegetables, a slice of vegan cheese and beetroot, and a basket of fries and salad on the side. I’m on the fence about the patty. It didn’t taste like vegetables (which is a huge plus), but neither did it taste like beef to me. It was definitely tender and creamy, with that melt-in-your-mouth juicy goodness like a good ‘ol wagyu burger made of trimmed fat. However, the texture was more like chicken and I would’ve liked a bit more fat to accompany the patty for a bite with more spring to it. As an entire burger, I loved it. The beetroot was sweet, tangy and almost pickle-like, which reminded me of a cheeseburger, while the charcoal added a pleasant nutty and smoky aftertaste. Though the patty didn’t win me over, I thoroughly enjoyed how thick and juicy it was. Lime Restaurant’s Fishless Fish & Chips (S$25++) was intriguing enough from the dish name alone, so I was beyond excited to try it. We’re told that it’s made primarily of soy protein, wheat flour, canola oil and tapioca and potato starch. The soybeans, wheat and canola are all non-genetically engineered, so you can be assured that what you’re eating is entirely natural (even though ironically, there’s nothing natural about fishless fish & chips). Taste-wise, this was absolutely spot on. The mock meat was creamy, smooth and soft, just like actual fish meat, with a natural sweetness from the added spices. I loved how crispy and light the fish & chips’ batter was, and how the added omega-3 oil, DHA algal oil, coated my tongue after. While there was a flakiness to the mock meat, the texture resembled minced meat rather than fish. 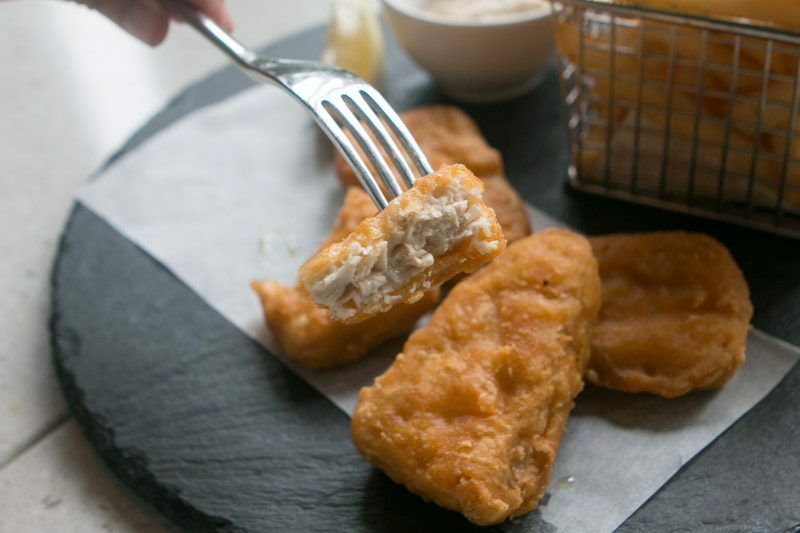 It’s difficult to describe, but imagine taking apart a cooked fish’s flesh and repurposing them into fish nuggets. 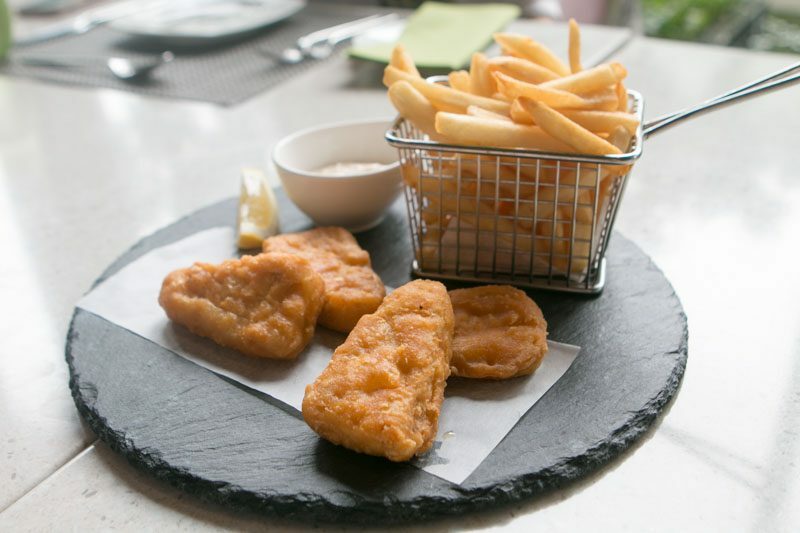 Lime Restaurant’s Fishless Fish & Chips resembled just that — the meat came apart in little strands rather than whole silky flakes, like how a cooked barramundi or salmon would. 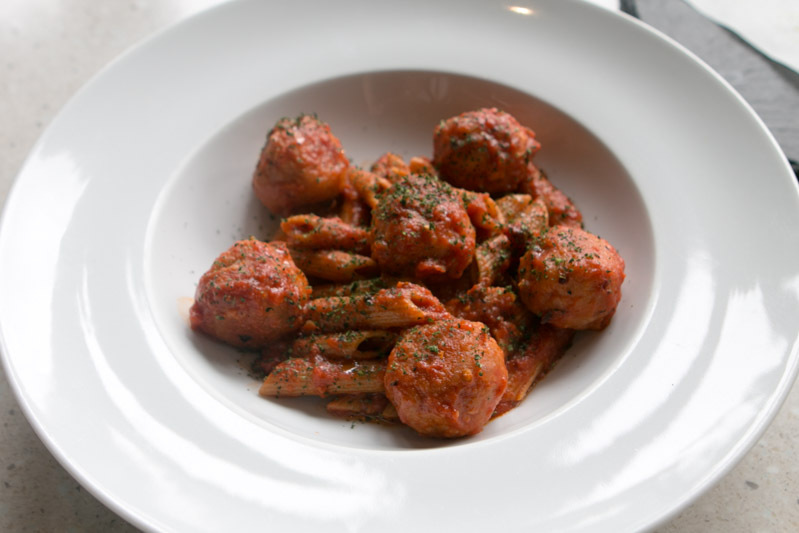 One of my favourites on the menu, the Arrabbiata Pasta with Omnipork Meatballs (S$24++) was served with penne, spicy arrabbiata sauce, Omnipork meatballs and herbs. The Omnipork meatballs ticked off all the boxes on my list to the point where I was convinced I was eating actual pork instead of shiitake mushrooms, peas, non-genetically modified soy and rice. It was juicy, springy and succulent, and the mock meat had enough of a bite to it to win me over. It really tasted like an actual pork meatball to me. As for the accompanying sauce, the arrabbiata was peppery and delightfully piquant, with an aromatic herb aftertaste. 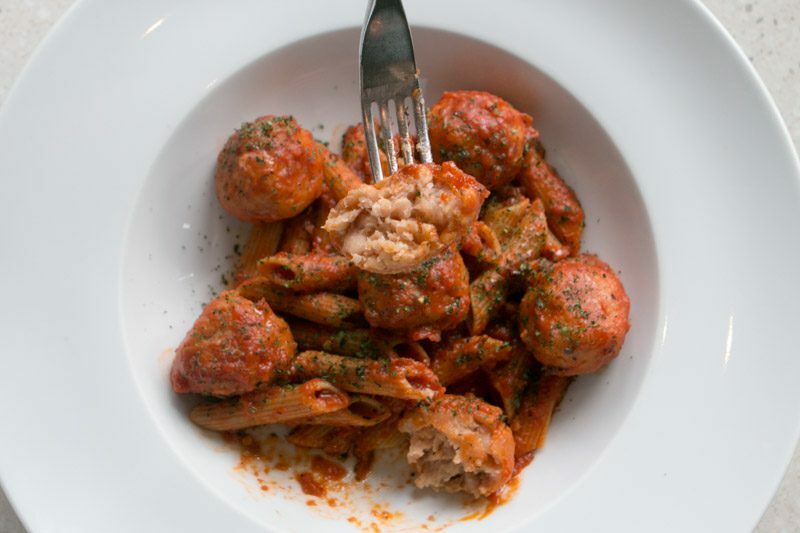 It was a great match with the meatballs and penne pasta. 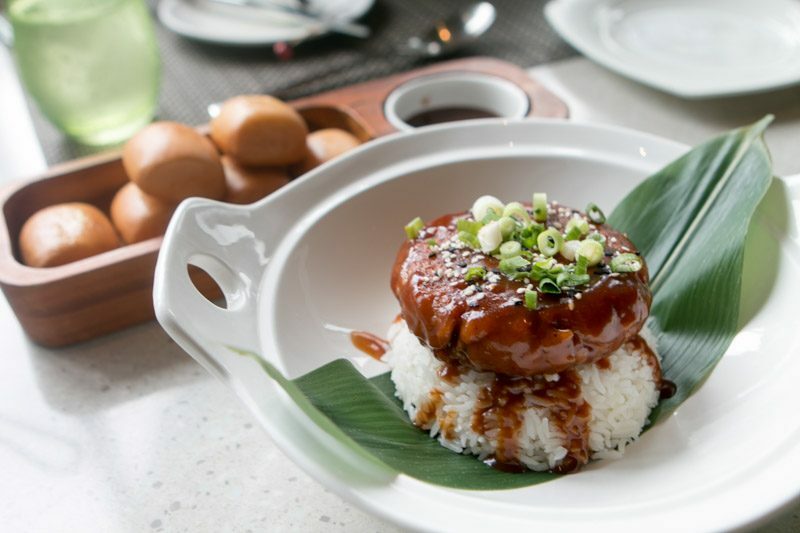 If you’re like me and can’t forgo your carbs for the day, try Lime Restaurant’s Omnipork Patty with Barbeque Sauce (S$22+). 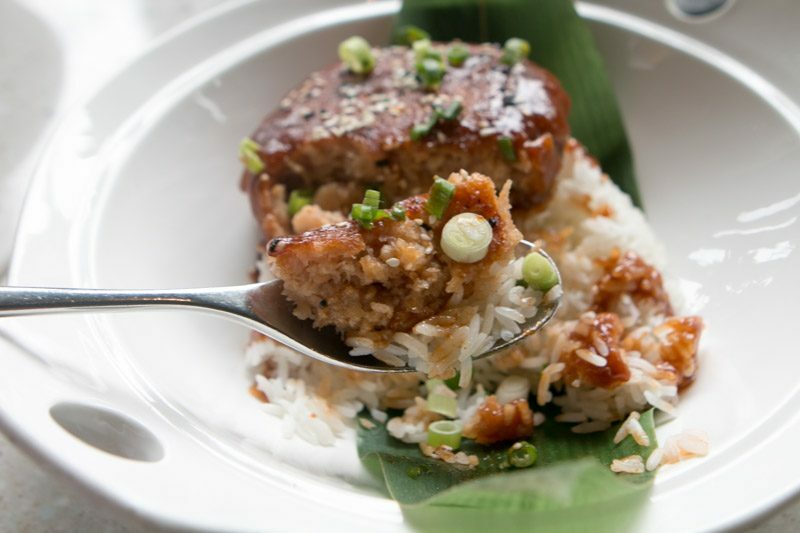 The mock meat patty will be accompanied by fried mantou and fluffy white rice. Just like its meatball counterpart, the Omnipork patty was excellent. It was springy and tender, as if there had been fat added to the thick patty. The spring onions added a touch of raw zest to each mouthful and the barbecue sauce was smoky and tart. To be honest, the white rice could’ve used a tad more moisture — I felt myself hoping that the barbecue sauce was more liquid so that each spoonful of rice was moist and flavourful. Instead, it was dry and a little tough, and distracted my tastebuds from the Omnipork patty. I personally preferred having my Omnipork patty with the fried mantous, because who can say no to buttery mantous? It was fried to a glorious crisp, with the fluffy and soft insides. 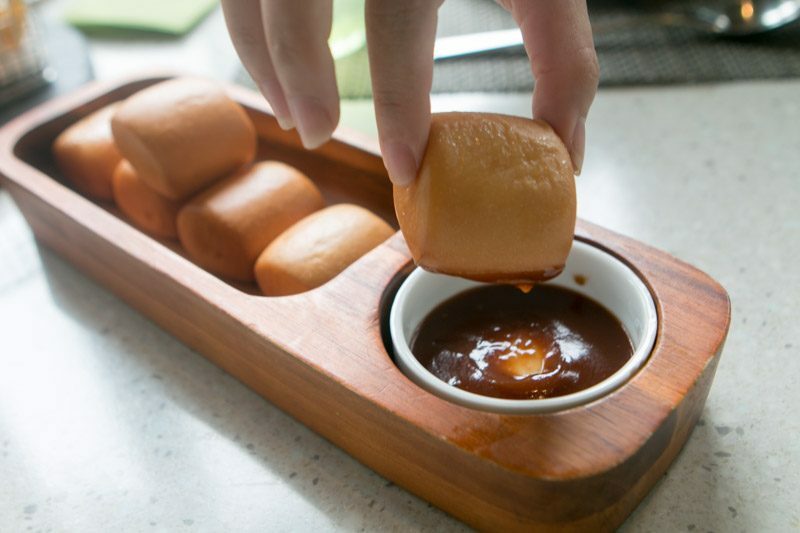 Dipping the mantous in the smoky barbecue sauce was super addictive and before I even noticed, I was reaching for my next mantou already. 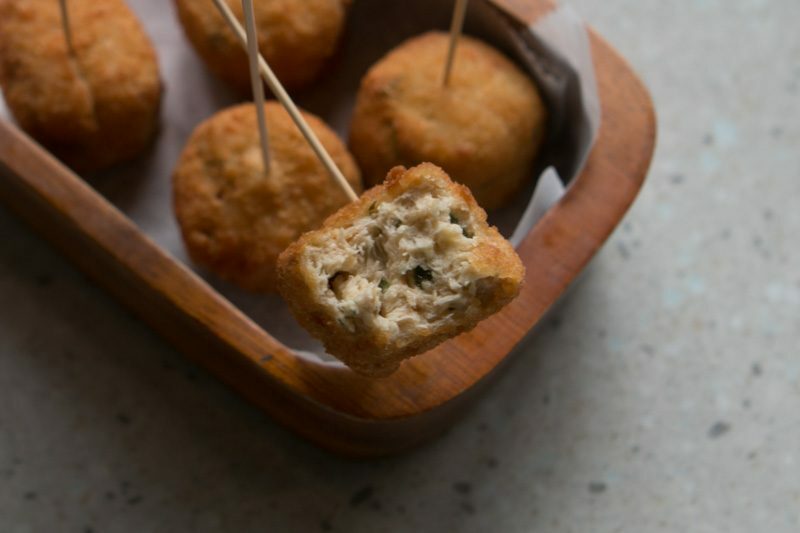 If you’re looking for appetisers to share with your dining companions, go for the Wasabi Crab Meat Balls (S$18++). This dish is entirely vegan and dairy-free, with wheat and corn protein, wheat flour and canola oil forming the bulk of the mock meat. It came with a creamy wasabi dip, and it’s perfect for sharing. Deep fried till a golden crisp, these crabless meatballs were naturally sweet from the corn protein and organic cane sugar. There was actually a surprisingly spicy kick at the end from the pepper. I absolutely loved the wasabi dip. It was fragrant with a gentle heat, and its iconic horseradish-like spiciness was mildly pungent and was powerful enough to make my eyes water. Paired with the crabless meatballs, it made for a delicious appetiser and it whetted my palate. To me, a meal isn’t complete without dessert, and Lime Restaurant’s plant-based menu offers two vegan sweet treats. 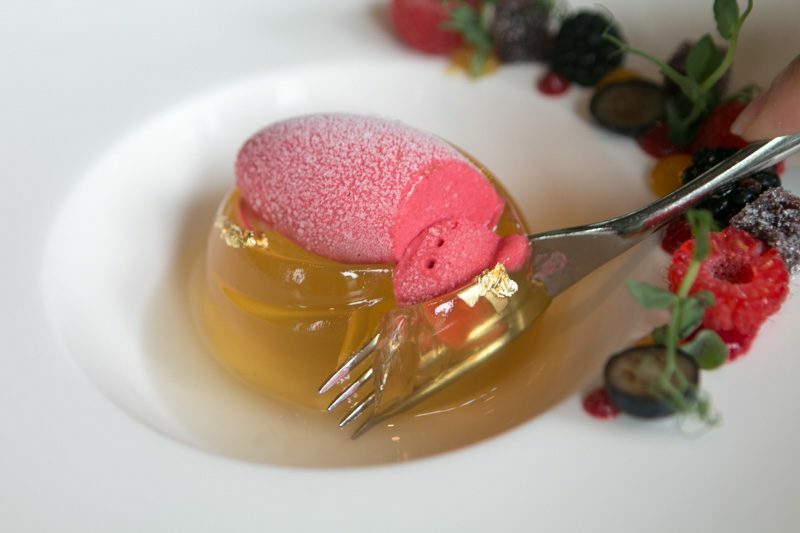 The first was Lemon Grass Aiyu Jelly with Berries and Raspberry Sorbet (S$14++). 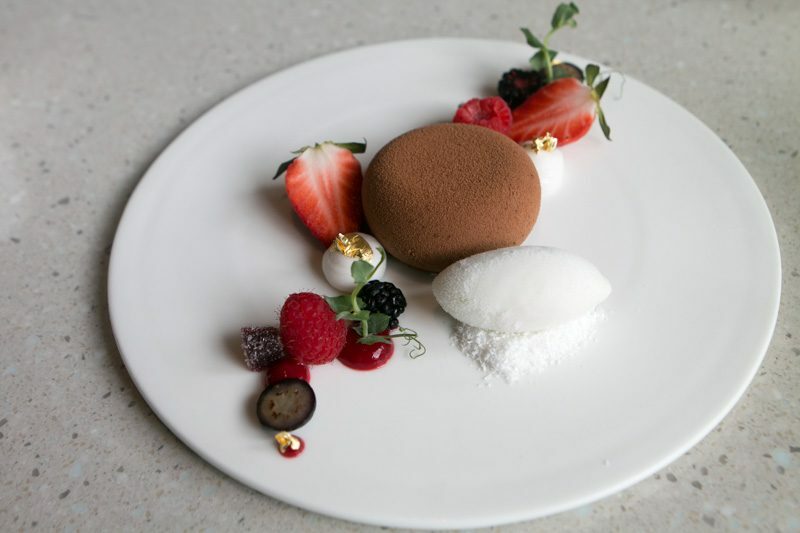 The dessert was superbly well-balanced in terms of flavours and textures. The lemongrass aiyu jelly was light, fragrant and citrus with had a faint mint aftertaste, while the raspberry sorbet was tangy and sour. 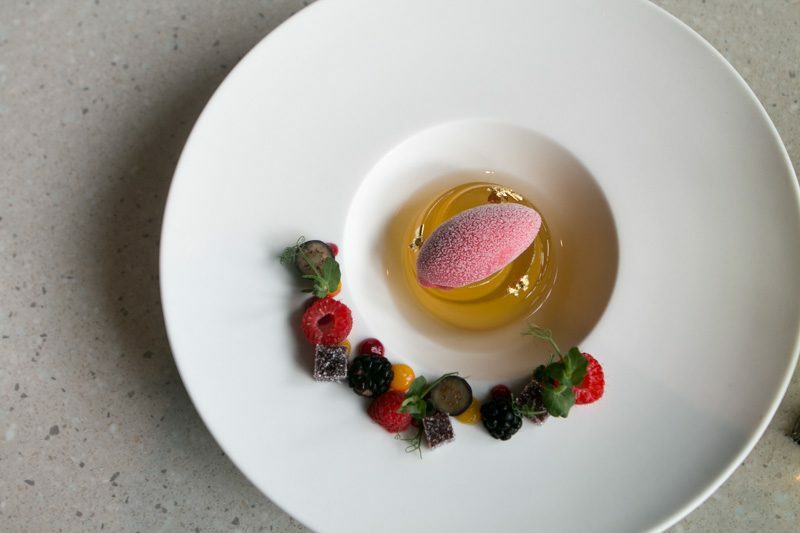 The delicate and smooth aiyu jelly also contrasted with the icy cold and rich sorbet. You should finish this dessert quickly as both the aiyu jelly and the raspberry sorbet melted pretty fast. Chocolate lovers are definitely in for a treat with Lime Restaurant’s Coconut Chocolate Mousse Cake with Lemon Lime Sorbet (S$18++). Don’t be fooled by this sinful dessert — it’s vegan as well, as the restaurant replaced all the dairy ingredients with coconut instead. Cutting into the gorgeous dome-shaped chocolate mousse cake revealed a dense layer of chocolate, cream, and a biscuit base. This dessert was sooo good that I couldn’t stop going “mmmmm” the minute I ate it. Beautifully indulgent, rich and creamy, enjoying the cake was absolute bliss. The biscuit base at the bottom reminded me of fudge brownies, with a sticky sweetness from melted chocolate and butter, and added a slight tinge of dark bitterness to each mouthful. My tip? 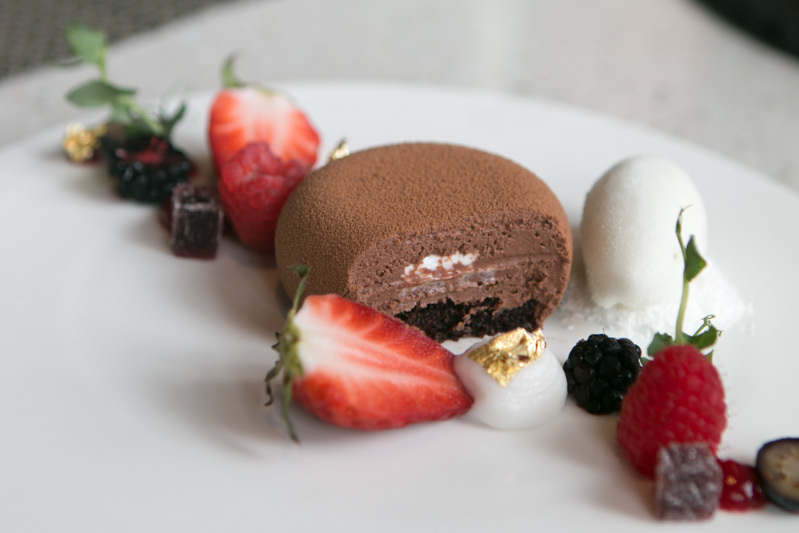 Alternate each bite of the chocolate mousse cake with the sharp, biting acidity of the lemon lime sorbet. 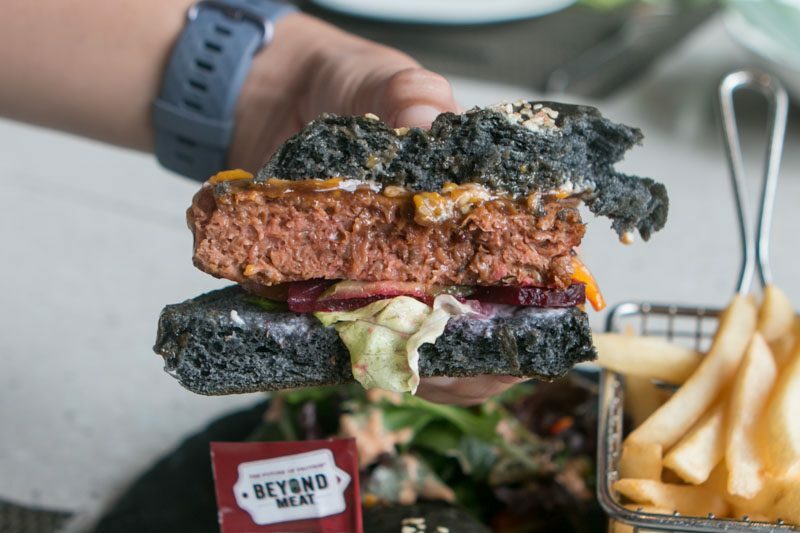 If you’re looking for a meat alternative that tastes, feels and looks exactly like meat, the Beyond and Omnipork patties might disappoint you a little. 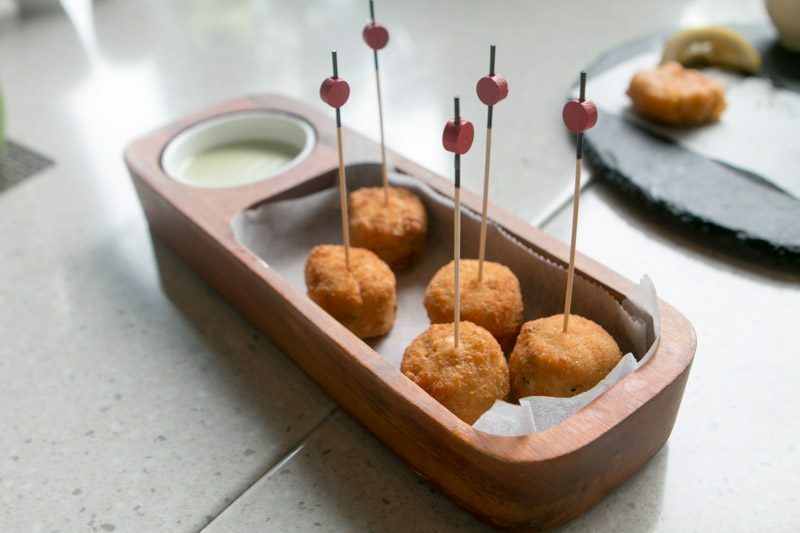 But consider the fact that these are made entirely of plants and you cannot deny that Lime Restaurant has done a decent job of turning these mock meats into delicious dishes that appeal to your tastebuds and fill your tummy. Although I ate quite a lot at this meal, I left feeling full and satisfied. There wasn’t that familiar overly bloated feeling, and I attribute that to the fact that I just had an entirely plant-based meal. It’s definitely satiated my appetite and piqued my interest enough for me to go for a plant-based dish the next time I’m out. *This post is brought to you in partnership with PARKROYAL on Pickering.